Hey everyone...Travis here with a quick note about one of the coolest places in town. 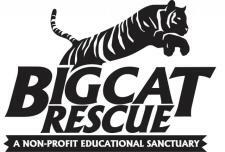 It&apos;s also a place where you can get up close and personal with some big cats - yep, it&apos;s Big Cat Rescue. Me and a few of my friends (go Team Liger) are heading out there today to do a little exploring. We&apos;ll be back later with photos and an update about how it was, but if you&apos;ve never been to this place, you need to plan your next trip immediately. Not only can you take a tour and see these amazing animals, but you can even schedule a feeding tour, and take home a souvenir to remember your trip. Plus, you can stand three feet from a 750-pound tiger, take photos that everyone will think you took on a safari and experience 100 wild cats and one wild time! Like I said, I&apos;ll be back with more updates, but start planning your trip, and take a look at their website - www.BigCatRescue.org. You&apos;ll certainly find some fun and great things to do in Tampa Bay during your trip there.